The indicators that investors should look at are those that have worked historically, Evans said in a note. These are: the shape of the yield curve – which has almost always inverted before a bear market- a rise in credit spreads, low cash holdings by investment institutions and sell-side analysts having lots of “buy” ratings. None of these signal a bear market – a 20% or larger prolonged decline in stock prices. In the last 50 years, every recession has been preceded by an inversion in the yield curve (short-term rates higher than long-term rates) or at least the curve getting close to inversion, according to Evans. The only time when the yield curve has failed was in 1987, when the classic yield curve – the 10-year Treasury yield minus the three-month yield – did not signal the Black Monday crash. The signalling ability of other yield curves (the 10-years/5-years or 30-years/10-years) has been similar to the classic one. Their steepness has “flattened a touch over the past few months” but the yield curves “are all still extremely steep and nowhere close to inverting,” Evans said. Credit spreads are a good indicator of whether a bear market is coming because usually bond investors are quicker to spot risk than investors in stocks, because bond investors are more focused on the potential downside since the upside potential is limited. 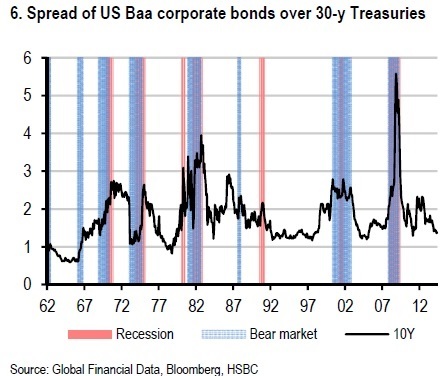 In recent decades, every recession and bear market has been preceded by a rise in credit spreads – the difference in yield between US Baa-rated corporate bonds and US Treasuries. The only exception was the 1990 recession, which did not turn into a bear market. Currently, the credit spread has fallen by 27 basis points over the past year. It has continued to fall since the beginning of this year. One way to judge how bullish or bearish fund managers are is to look at how much of their assets they hold in cash or other liquid assets. Cash levels were unusually low before most bear markets over the past 50 years, Evans said. Moreover, they fell rapidly a few months before the 2000 and 2007 market crashes. In 1980, however, cash levels were still high – but this could be explained by high interest rates at the time. Currently, cash levels are low compared to the long-run trend, but that is mainly because interest rates are close to zero. Compared to the past 15 years, cash levels are “rather high” currently, according to Evans. The ratio of liquid assets had risen to 5.4% at the end of March (the latest available data), compared to 3.5% in mid-2012. Finally, “neither do we see any sign of great bullishness among sell-side analysts,” he said. The average consensus rating for each company is as follows: Buy rating scores 1, Overweight rating 2, Hold 3, Underweight 4 and Sell 5. Valuations for US stocks “are a little on the expensive side,” Evans noted, with a trailing price/earnings ratio of 19, but still below the level at which stocks peaked in 1987 (PE of 21), 2007 (PE of 23) or 2000 (PE of 28). After last year’s strong performance, stocks will “grind higher” this year, “with earnings growing by around 10% and multiples staying flat or even slightly declining as the Fed moves towards monetary tightening,” he predicted.